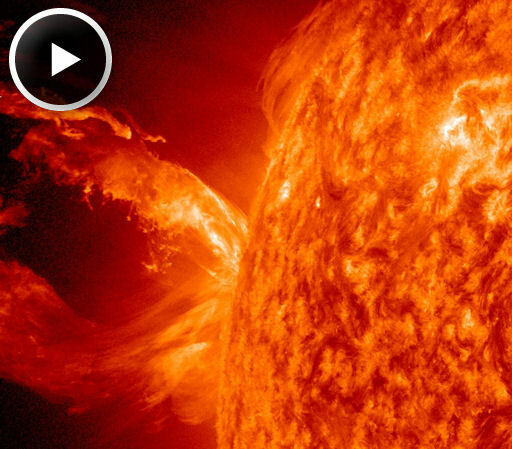 Our sun has been busy, purging plasma with the vengeance of Thor. 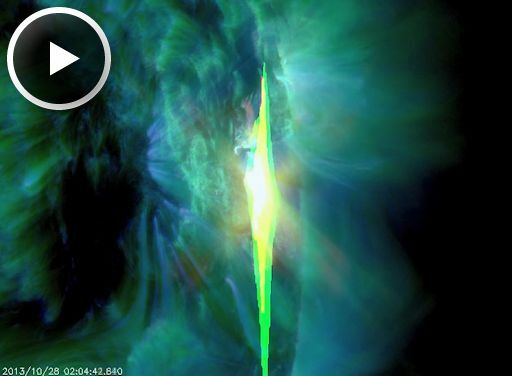 A X-1 flare from sunspot AR1875 on Oct. 28 is the third X-class flare since Oct. 25. This follows three M-class flares since Oct. 20. None of the recent flares are likely to give any direct hits to our magnetic field; instead “glancing blows” are likely to stir up geo-magnetic storms, resulting in spectacular auroras. For the next 24 hours, Solar Dynamics Observatory predicts a 75% chance of M-class and 30% chance of more X-class flares. My secret wish is for solar hiccups to last long enough for my trip next week to the Canadian prairies; the home of endless, dark, crystal clear skies. A place to take in the majesty of Northern Lights. Solar activity makes me giddy; I prickle with school girl excitement at the mere mention of an earth directed CME. I knew the sun was getting a little uppity – a visit to http://spaceweather.com/ when I got home from work set my heart a flutter. 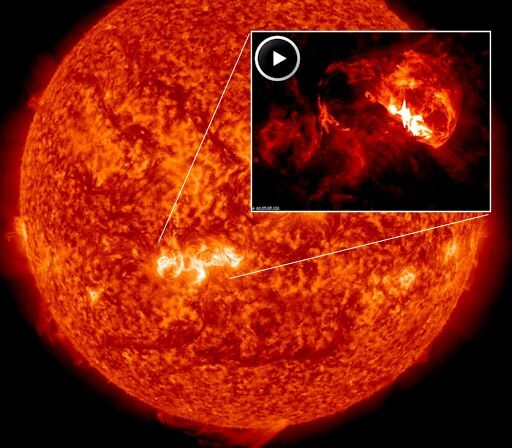 Our sun has been busy – three flares between Oct. 20 – 22 have apparently merged into one; promising to light up our magnetic field with auroras. Another powerful M-9 class flare hurled earthward yesterday, arrival time as yet unknown. Sunspots AR1875 and 1877 are ready to speak their minds – both strutting their stuff – ready to make a statement. Predictions of activity in the next 24 hours may not be earth shattering – 40% chance of M-class and 10% chance of X-class flares – still enough of a magnetic storm for ridiculous northern lights. Meanwhile, Comet C/2012X1 exploded 450 million Km’s from earth. Of little significance to our little corner of the universe, yet worthy of a look low on the eastern horizon an hour or so before sunrise if you happen to have a telescope. Solar winds are relatively low at 345 Km/second. This concludes tonight’s space weather report. Stating I was passionate about space weather would be a gross understatement. Saying I’m at a loss to comprehend why a majority of the population hasn’t the foggiest notion how space weather impacts earth, would be a completely accurate statement. Pleading the case to Canadian radio and television stations hasn’t garnered so much as a polite “thanks, but no thanks”. Long ago giving up on “educating” people I know – tired of eyes glazing over just before they roll, accompanied by a polite “that’s interesting” – my head screams ARGH as I change the subject. Yesterday I received news prompting a happy jig in front of my computer screen. Within minutes I was on the phone to my like minded brother – excitedly asking “have you heard the news?” NOAA plans to launch DSCOVR – the Deep Space Climate Observatory in 2015. Proposed in 1998 by then Vice President Al Gore, and known as Triana or GoreSat, it was intended to give a continuous view of the sun and sunlit side of the earth. Gore saw it as a chance not only to raise awareness through a continuous internet feed, but as a tool to measure UV light making its way through the ozone layer – hence tracking global warming, cloud patterns, weather systems and early warning for approaching solar storms. It was put on the back burner by George W. Bush shortly after taking office. 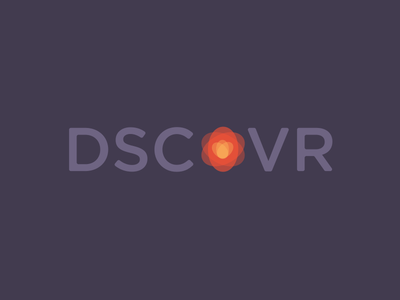 In November of 2008 the Obama administration dusted off the $100 million dollar satellite; by 2011 actively securing funds for a proposed launch – the project was renamed DSCOVR. When John Zande – http://thesuperstitiousnakedape.wordpress.com/ messaged me yesterday with news of the proposed 2015 launch – I practically swooned. Trust me; this is BIG news. I’ll spare all you glazed over eye rollers another account of the Carrington or Bastille Day events. Anyone left standing with the slightest interest – I applaud your pondering mind; fingers crossed you’ll “think about, talk about, learn more about” the importance of space weather. Massive sunspot AR 1785 – eleven times the diameter of earth – now faces our planet with potential for some nasty flares. Space weather forecasters at NOAA predict a 55% chance of M-class and 10% X-class for today. Luckily earth has the magnetosphere which deflects solar wind and concentrates solar energy at the magnetic pole. Scientists have known for a long time the magnetosphere wasn’t perfect; just as the ozone layer develops “holes”, our magnetic shield is prone to “cracks”. Anyone lucky enough to see an aurora has witnessed the power of electrically charged solar winds. In 1961 scientist Jim Dungey theorized these cracks occurred when the solar energy arrived packing a magnetic field that travelled in the opposite direction from our magnetic field. We now know these cracks can remain open for hours, allowing billions of electrically charged particles to light up the sky. Severe solar storms can wipe out satellites, communication, and power. AR 1785 will most likely blast tons of plasma into space before fading away. Geomagnetic storms will rage – airplanes might change course to avoid radiation, auroras will dazzle, and few will be the wiser. I don’t lose sleep over space weather, I just wish more people understood the implications of a direct hit through an unlucky crack that could plunge us into darkness for months. 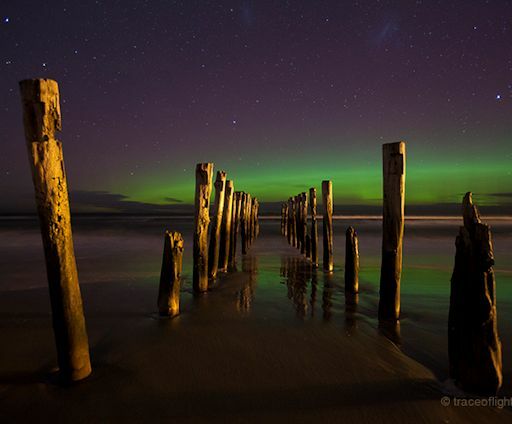 Photo by Taichi Nakamura of Dunedin New Zealand – southern hemisphere auroras when earth passed through a region of southward magnetic field, opening a crack in the magnetosphere on July 6. I wouldn’t be a particularly responsible space weather geek if I neglected to report on uppity sunspots. Sunspots AR 1730 and 1731 are getting cranky; currently a 40% chance of M-class and 5% chance of X-class flares in the next 24 hours. Ho hum you say? Most likely the case – but never fear, I’m on the job and will let you know if any spectacular eruptions take place. I just heard from my sister in Saskatchewan; feeling green with envy as she’s sitting on her front steps watching the Northern Lights dance. Auroras are a magical gift – they find you, wrap their arms around you, and feed your soul. Argh – so jealous. An extremeophile is an organism that thrives in extreme conditions. Particularly fond of geothermal vents, and Arctic ice, they are able to survive under unimaginable conditions. 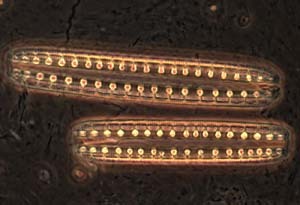 With this in mind, one must ponder the possibility of other ” extreme ” life forms in our universe.